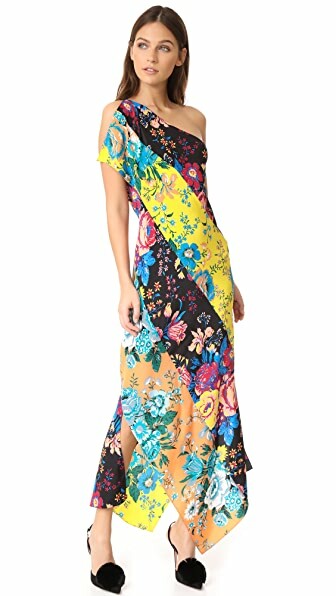 A color-saturated Diane von Furstenberg dress, composed of patchwork panels in mixed floral prints. Runs a little big, but will keep the small. A tie closure secures the single shoulder, and the angular hem falls to draped points. Just a perfect proportional fit. Unlined. One black, one white, so they will go with anything. Fabric: Plain weave. The sleeves come exactly above ur elbow and don't pull down. 100% silk. Even strangers stop me and ask me where I got it. Dry clean. I reeceive a lot of compliments when wearing it. Imported, China. Washed in cold, hung to dry and it was ready to go! Totally exceeded my expectations! Measurements Length 1: 43.75in / 111cm, from shoulder to shortest point Length 2: 59in / 150cm, from shoulder to longest point Measurements from size S And to make a touch more modest I'll wear a Cami and also take in the side slits. This entry was posted in Reviews and tagged Diane Von Furstenberg Clothing > Dresses > Cocktail on by Better.